Trailer Life Feature Article - Sedona Arizona! Trailer Life Feature Article – Sedona Arizona! 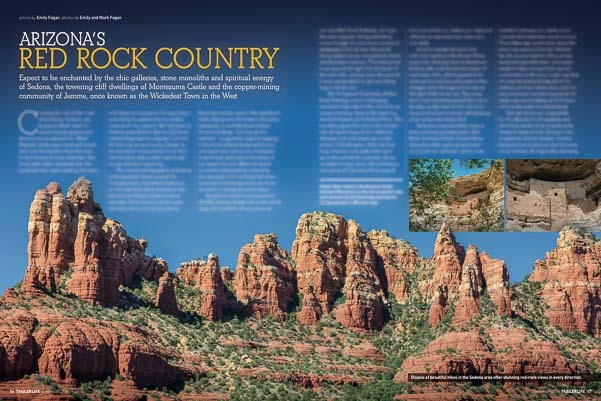 The December, 2014, issue of Trailer Life magazine is featuring our article about the stunning red rock country of Sedona Arizona. We spent a delightful few weeks there last spring, hiking, biking and soaking up the stunning views that fill the small northern Arizona town. It is an enchanting area that you can’t help but fall in love with when you go, and there’s a little something for everyone, from cute boutique shops to elegant dining to glorious hikes to mysterious spiritual vortexes. If you get bored in town (hard to imagine! ), there are ancient Indian ruins and a true wild west town nearby too! Trailer Life is a terrific magazine for all RV enthusiasts, offering tips and tricks about towing and towables and showcasing special places around the country that are worthy of an RV road trip. Right now, if you join Good Sam Club, you get four issues for free too! We’ve been subscribers for years and really enjoy each issue. The December issue is on newsstands now, in either the travel section or the automotive section (I’ve seen it in both places). It can also be found at Camping World and other RV and camping supply stores.